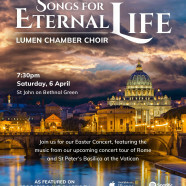 Join us for our Easter Concert, featuring the music from our upcoming concert tour of Rome and St Peter’s Basilica at the Vatican. Music to include René Clausen’s “Set Me As a Seal”, Blake Henson’s “My Flight For Heaven”, and Dan Forrest’s “Entreat Me Not To Leave You”. Entry is free and there will be a cash-only bar.